I was doing my Sons of Hodir dailies today as Holy (still working my way to exalted), and it struck me that if Shield of Righteousness had a Spellpower coefficient, it would be really useful for Holy soloing. Since Strength now contributes a lot to block value, Protection and Retribution get a lot out of the first term, and the 400 is just icing on the cake because 200% of block value was too powerful. But since Holy has no strength, the second term dominates, and the first term contributes less damage. My ShR hits for about 670 damage. It would suddenly be a lot more useful. Both Protection and Retribution have talents granting them a small amount of spellpower, so they won't miss the base 400 damage. But it would make the spell scale for Holy, and give them a nice extra attack for soloing. I agree! I've been wishing it got something out of spellpower ever since my healadin first tried it out. Scaling with spellpower would be nicely targeted, since it'd help Holy soloing but not overpower it too much for Ret and Prot. That would make too much sense hehe... 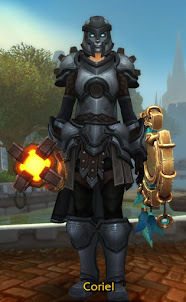 Though in all honestly I don't feel too bad on my holy paladin. I don't kill things like lightning, but he's still feels stronger than he was in TBC and solo-ing with him isn't an mind-numbing as I thought it would be. As a protadin, i'm very happy wth the way SotR works tbh, I dont think it needs to scale of Spellpower. "1) Why on earth are you questing as Holy?" Too much sense = ending up on Blizzard's scrap heap. Because I'm not exalted with Sons of Hodir yet, and respeccing every day just to do a few dailies seems excessive. I don't know. You might need to tank or off-tank something and you don't want to bother with respeccing. In general, I think it's a good idea to make sure each ability at least works decently with each spec. Just in case. In general, I think it's a good idea to make sure each ability at least works decently with each spec. I would say, though, that SoR does fit this bill. Sure it's not optimized for Holy, but they still get a pretty decent amount of damage from it regardless. Heck, you could even toss on some Ret gear and actually get a pretty decent bonus, unlike Prot. Prot already scales on Stam and Str, so switching to Ret gear just makes me feel awkward since few of my abilities really match the way I should be attacking. Its still worth throwing in your rotation when you have a spare cooldown. It's cheap, it procs Seal and Judgement of Wisdom, so its essentialy free or likely mana positive bonus damage. I think having ShoR changed to do Block Value plus something like 2/3 of spell power would be fine. As a mostly 25-man geared tank I run with 714 spell power(Entirely from Guided by the Light). 2/3 of that works out to be about 470, which is a bit higher, but at lower levels it would work out to about the same, if not less than it is currently. An alternative option is to bake it in to yet another deep level holy talent, like Divine Illumination. It may have to be stricter in terms of the coefficient, since I've seen Holy paladins with 2500 spell power, and a Holy Pally with ShoR hits in the 2200s before crits for less than 200 mana every six seconds starts to look too much like the Shockadins of old. Not that I have a problem with that. Again, you've made another post, explaining perfect, simply mechanics to fix a certain aspect of the Paladin class. Again, Blizz will keep to their own, somewhat unbalanced mechanics. Holy pallies should have aura of norris, that roundhouse kicks mobs with the power of light, reckoning, and justice. Or alternately they should make game content that can only be passed as a healer, such as keeping NPC's alive as they go after a certain task. In that case can protection paladins get a free holy shock? Holy paladins have that hitting for about the same as my prot hits ShoR.